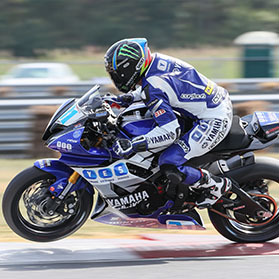 Graves Motorsports Yamaha FZ10 / MT-10 EVR Cat Eliminator Exhaust with (Exhaust Valve Race – Butterfly Valve Technology). Requires FTEcu software purchased separately to use the EVR activation map code included with the sale of the exhaust. 1 Auto Tuner Style Lambda sensor receiver comes standard (OEM dual sensor mounts up front are eliminated for a smoother flowing exhaust). When using any Graves performance system on the FZ10 / MT10 Flash Tune products are recommended to enhance the bikes performance everywhere. The most effective tune on this setup does not utilize the stock lambdas at all). WOW, you guys are really top notch. I can't believe how smooth and linear the power delivery is now! Keep up the great work Graves. 1 thing you could do is have a video of how to use the scratch off code in the FTECU software. It took me a minute to figure out that I had to register it on the FTECU website to allocate it to my ECU license. Other than that install was a breeze.